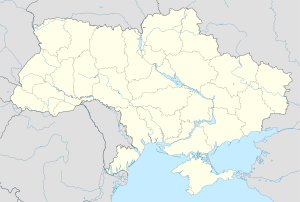 Ukraina es un del paises de Europa est que borda al west con Moldavia, Romania, Hungaria, Slovachia e Polonia, al nord con Bielorussia, e al est con Russia. Illo ha un area de 603628 km² — includente Crimea, quem vicinante Russia controlla — facente ab illo le maxim grande pais integremente intra Europa. Le territorio de Ukraina esseva habitate dum al minus 44000 annos, e le pais esseva candidato pro le domestication del cavallo e pro le origines del familia linguistic indo-european. ↑ Chin, Richard (2011). Global Clinical Trials. Elsevier, 345. ISBN 0-12-381537-1. ↑ Evans, Chandler (2008). Future of Google Earth. BookSurge, 174. ISBN 1-4196-8903-7. ↑ Basic facts about Ukraine. Ukrainian consul in NY. Recuperate le 10 November 2010. ↑ Gray, Richard (18 December 2011). "Neanderthals built homes with mammoth bones", Daily Telegraph. Recuperate le 8 January 2014. ↑ What We Theorize – When and Where Did Domestication Occur. International Museum of the Horse. Recuperate le 12 December 2010. ↑ "Horsey-aeology, Binary Black Holes, Tracking Red Tides, Fish Re-evolution, Walk Like a Man, Fact or Fiction", Quirks and Quarks Podcast with Bob Macdonald, CBC Radio (7 March 2009). Recuperate le 18 September 2010. Iste pagina esseva modificate le plus recentemente le 6 junio 2016 a 14:04.